This 500m long beach is nestled on the edge of the Agriates Desert and the Vallée de l’Ostriconi. The beach is best described as a haven of peace, calm, beauty and tranquillity. Ostriconi Beach somehow allows visitors to escape from the tourist traps and immerse themselves in the true local flavour. The fine white sand slips into clean turquoise waters in a particularly wild beach setting and really shows off all that this part of Corsica has to offer. 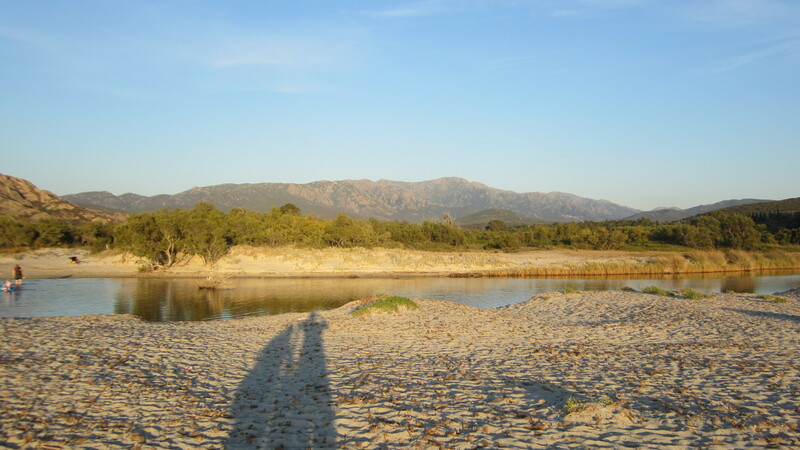 The beach is surrounded by sandy dunes and maquis (various types of scrub), with the Ostriconi River, rocky hills and mountains as a backdrop. You may find a few cows visiting the beach from time to time. A hidden local secret in the past, the beach does get more popular with summer visitors and while it never gets overly crowded, the beach does get busy during summertime, and is one of the features of the nearby camping area. However, during the cooler months you may well have the beach to yourself. As the beach faces west, you will be able to make the most of your visit and appreciate a spectacular sun-set over the Mediterranean. The nudist section is towards the northern end of this long beach and during the summer months will have a strong contingent of nudists with quite a few family groups. The beach has a small kiosk that has available the usual refreshments, snacks and light meals. Various surfboards and a range of other personal watercraft and accessories are available for hire for the more active among us. To get there: you will really need a car to visit this beach – the Ostriconi Beach turn-off is found on the road N1197, some 28km north of Ponte Leccia (25min), and only 13km east of Ile-Rousse (15min). The turn off from the N1197 main road is well signposted as is the camping area ‘Village de l’Ostriconi’. Parking is free on the side along the 500m of the road. Although you will have some breathtaking views onto the beach, the valley and the mountains, the road is narrow and in poor repair. The lack of any designated parking makes this situation worse considering the volume of traffic. In parts it will be one single lane due to parked cars on both sides and there will always be someone coming in the other direction at the most inopportune time. Once you manage to find a parking space, access to the beach is a walk via a dirt trail through the scrub, down the side of the mountain, where you will also need to carry your beach essentials. This is not an easy prospect and the less agile might be best to consider another beach. Especially bearing in mind that you will need to clamber back up the trail after your idyllic beach day. The magnetic properties of the sand won’t help either, particularly with thongs. Another option is via the path from the camping area. But you will need to cross the Ostriconi River, and there seems to be no bridge or dry crossing, so expect at least some wet feet and depending on the height of the river maybe more. This beach is a delight and despite the access difficulties it’s well worth the effort.